This might be my favorite card in the whole set, or at least one of them. I love dragons (every color needs flying creatures!). I love 4/4 creatures. I love drawing cards in ways that are more interesting and fair than "End of turn, I'm so far ahead lolol" (every color needs more of those, too!). And don't be fooled into thinking he competes with Thunderbreak Regent at this cost - the whole point of that card is to get you to play more dragons at one time! 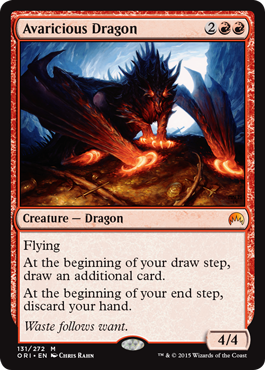 4/4 with Flying that that adds an extra card at your draw step with the drawback of discarding your hand. This is an excellent top of the mana curve play for a mono-Red burn/evasion build that benefits from the speed with no real risk of discarding anything. Outside of that very specific full aggro design the drawback would keep it from nearly any other deck, so it should see some play competitively in a dedicated build only. In Limited the card advantage and 4/4 for four evader outweigh the drawback if the mana curve is kept on the lower end of the format. For that and the risk of letting another player possibly build around it this should be a first pick in Booster. In Sealed this requires a fairly complimentary pool of lower mana cost and solid Red cards to make it worth playing, but the strength should motivate the build towards Red whenever possible. Hm. At first, you see drawing cards as a great opportunity. Then, you realize that you won't be playing anything short of creature effects on your opponent's turn. No kill spells, no counters, no burn, nothing. That, is a huge drawback not a lot of people have thought about yet. Sure, in multiples, you're drawing an extra 2-3 cards a turn, but it's tricky to win a game effectively at sorcery speed.